You may have spotted the Rich Hair Care line in chemists nationwide or perhaps heard beauty bloggers waxing lyrical about the luxury results achieved with over the counter prices (My voice being one of the loudest) but I had to share these two new additions to the brand with you. 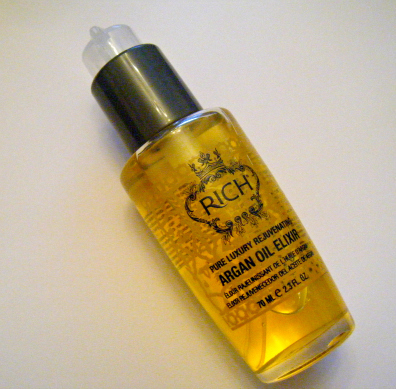 Rich Hair Care Pure Luxury Rejuvenating Argan Oil Elixir and Argan De-Frizz & Shine Mist have made my grúaig wrangling days fewer and further between and perhaps they could do the same for you. The first point to note with these curly, damaged and dry hair saviours is that all is not as it seems when it comes to 'Argan Oil' claims. It would appear that any product with even a whiff of the stuff plasters the name in very large print on their bottles regardless of the ingredient contents. That though is a very small point, unless you're a stickler for that kind of thing. Think of these products more as a bounty of silicones and you're going to be one happy bunny, I know I am. My hair slurps silicones up with wild abandon and repays me with silky soft hair for days afterward. Not just mine though but the Gorgebags' too and they're a little oilier in the hair stakes than I.
Comprised of a blend of oils, Argan, Sweet Almond, Olive and Linseed, Rich De-Frizz & Shine Mist is designed to strengthen and condition the hair with just a couple of sprays. Promising to protect against heat and UV damage while delivering a mirror shine to locks without dragging or weighing it down. I'm going to recommend you use this very sparingly if oil is an issue for you but but if you're looking to reduce frizz, protect your colour and pump up the shine factor then you may have found just the spritz for you. Blended with Argania Spinosa Kernel Oil, Sweet Almond Oil and Olea Europaea Oil this elixir is quickly absorbed and 'gets to work deep in the hair shaft' (ooh er Missus). Again you're looking at a colour protection, UV and heat damage protection helping hand with this product and a smoother, tamer mane come drying time. 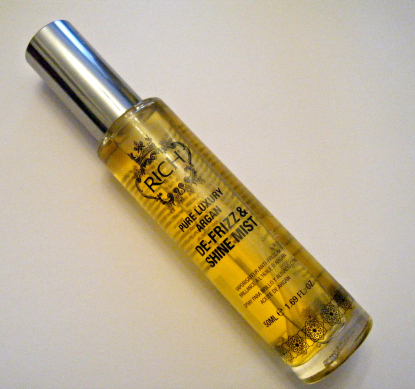 I warm two pumps of this luxurious oil in my palms and rub into towel dried hair, root to tip then style as normal. Truly I can still feel the siliconey goodness two days after a wash. I was so impressed with not only the smell and feel of this product but also the soft, manageable and completely tangle free results that I picked up a bottle for my Sis and her 6 year old girls. Their morning routine before they dash out on the school run has now been halved with a lot less tears and tantrums when it comes to hair brushing (and that's just their Daddy) So much so that Aoife swished her hair after her braid had been removed yesterday and insisted her Pops felt the softness. I'm going to chalk that down as a win, no? You can get the Rich Hair Care line from all good pharmacies and online but I'm going to steer you toward the shops on this occasion as prices seem to be €4.90 dearer on the world wide web - I'll investigate with the brand as to why that is but in the mean time tell me: Have you tried any Rich Hair Care products yet?